Middle Market Investment Banking and Financial Advisors. Standard Locknut, Inc. is a leading ISO certified manufacturer of bearing accessories and a broad line of precision machined products. The Company markets its products to a variety of industries including bearing, heavy construction, paper, mining, oil field, energy, automotive, and industrial industries. 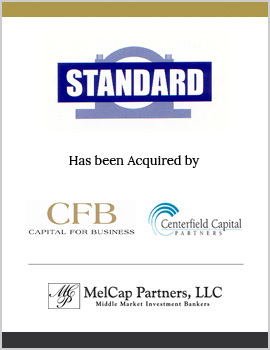 MelCap Partners acted as the sell side advisor to Standard. Standard Locknut was successfully sold to Capital for Business, Inc. and Centerfield Capital Partners, L.P., two experienced private equity groups. At MelCap Partners, our team of experienced industry professionals has a high amount of respect for business owners making pivotal decisions — whether they’re selling their business or expanding. We do our best to provide services that honor the work they’ve put into building their business from the ground up. We know the big events concerning your business are hard, especially if family is involved, and that’s why our team is ready to help so you don’t have to go through the process alone. We’ll help you navigate any challenges that come your way so you can successfully meet your goals and objectives. If you’re ready for help taking the next step in pursuing your goals, we’d love to use our experience to get you there. We know that getting to this point hasn’t been easy and we’re here to walk you through the process. If you’re ready to start, we’d love to have you connect with one of our professionals today. Depend on our domain experience in your industry to help navigate your transaction needs. Want to work with an experienced team dedicated to helping achieve your goals? MelCap and MAS are not affiliated entities. Check the background of MAS and its registered representatives on FINRA's BrokerCheck. The testimonials presented herein do not guarantee future performance or success. Get our recent articles delivered to your inbox. Copyright © 2019 MelCap Partners, LLC. All rights reserved.